We crunched the numbers and did some analysis of the Elite Men’s race lap times at the 2015 Cyclocross World Championships and it seems like many of you liked it. So we did a similar thing with the Elite Women’s race in Tabor. We sorted, analyzed and averaged the data, wondering what we might see by looking at the numbers. It’s fascinating for those of us who can’t get enough of top-level cyclocross racing, but probably as interesting as a stats class for many of you. We have three tables below, just as we did with the men’s race, separated mostly due to width constraints, and also because of the limitations of our sorting functionality in displaying these tables. It’s worth noting that these are just numbers. Numbers never lie, but conclusions about effort drawn from them can be inaccurate due to unknown mechanicals or crashes. A number can reveal a rider is inconsistent, but that doesn’t mean her output was inconsistent if she spent time riding a flat. Oh yeah, and there’s a chance we made an error. Let us know. While Wout van Aert and his fans might wonder what could have been had his fortune been different in the Elite Men’s race on Sunday, it’s hard to argue that two chain drops, a dramatic crash and a flat tire means the young Belgian just had bad luck on the day. Eva Lechner, however, might have a strong case for obsessing with the “what ifs.” After losing five minutes while running to the pits on lap one after her early crash, she then proceeded to turn out the fastest lap of the day on lap two, an impressive feat in itself after an exhausting half lap run. Her next laps were the third and second fastest, and her total time over the middle three laps was the fastest of everyone. She slowed down a bit on the last lap, but by then, there was little at stake, and she was still flying by racers to finish 31st, only 34 seconds behind Katie Compton. Lechner can take some pride in the fact she had the legs to battle for the win in Tabor. Consistency does pay off, at least in the women’s race. Three of the top four women were the most consistent racers of the day when looking at all five laps, with Brit racer Nikki Harris amazingly never straying more than four seconds from her average lap time. 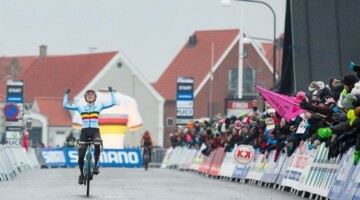 Bronze medalist Marianne Vos was the third most consistent racer, followed by silver medalist Sanne Cant. Second most consistent racer? That went to American Rachael Lloyd. She never strayed more than five seconds from her average lap time, and despite being disappointed with her race, gave a very consistent effort (her jersey at the finish appeared to reveal a crash). Honorable mentions to Dutch racer Sabrina Stultiens and Argentine Caro Gomez Villafañe. The women raced five laps, as opposed to the men’s eight, and thus there’s a bit less data to analyze, and unlike with the men’s race, we included the first lap into our initial analysis. Removing the first chaotic first lap doesn’t change much, with Harris, Vos and Cant still high up on the list, but Belgian Loes Sels jumps up to lead the pack. Looking at who had inconsistent lap times is a bit depressing for American fans, with three of the “top” six being Team USA racers (three of the top four ignoring lap one). Lechner leads the group with her disastrous first lap, which was a whopping 3:51 slower than her average lap, but she’s followed by Katie Compton who slowed down dramatically after lap two. Italian Chiara Teocchi, American Elle Anderson, Czech Martina Mikulaskova and American Meredith Miller followed, in that order. Teocchi had a rough third and fourth lap, Anderson had a similar ride to Compton, struggling on the last three laps, Mikulaskova had a slow first lap, and Miller’s lap times were up and down. 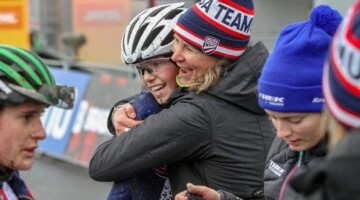 While American Zach McDonald spent some time in the superman position coming down the finish to have the (relative) slowest last lap in the men’s race, Compton wasn’t focused on putting on a show but still struggled to finish with a lap that was 52 seconds slower than her average (1:44 slower than her fastest). 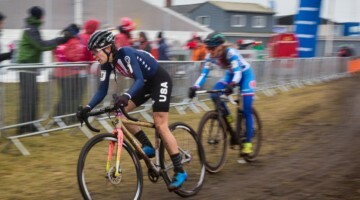 Miller finished up with a lap time that was 31 seconds slower than her average, followed by Japanese National Champion Ayako Toyooka (who just won Tokyo Cyclocross), and Anderson. You’re probably seeing a pattern by now, but Teocchi, Anderson and Compton all had fast first laps—much faster than their average lap times. France’s Lucie Chainel-Lefevre, who led much of the first lap, and holeshot winner, Brit Helen Wyman, also had fast first lap speed that wasn’t sustainable. Unlike in the men’s race, where only four racers beat their average lap time on the last lap, ten women hit the afterburners on the last lap (mostly due to the shorter race). It’s no surprise that Lechner led the pack, but winner Pauline Ferrand-Prevot showed her road racing endurance and turned in a final lap that was nine seconds faster than her average to take the jersey. Besides Lechner and Mikulaskova’s awful first laps, many other women struggled behind the first-lap chaos, including Dutch Sanne van Paasen and Swede Asa Marian Erlandsson. Canadian Mical Dyck, who finished 12th after her back-row start, could argue her starting position cost her a top-ten finish, with a first lap that was more than 14 seconds slower than her pace for the four following laps. See the raw data in the three tables below. Looking at this table, you can see how the final podium was decided. 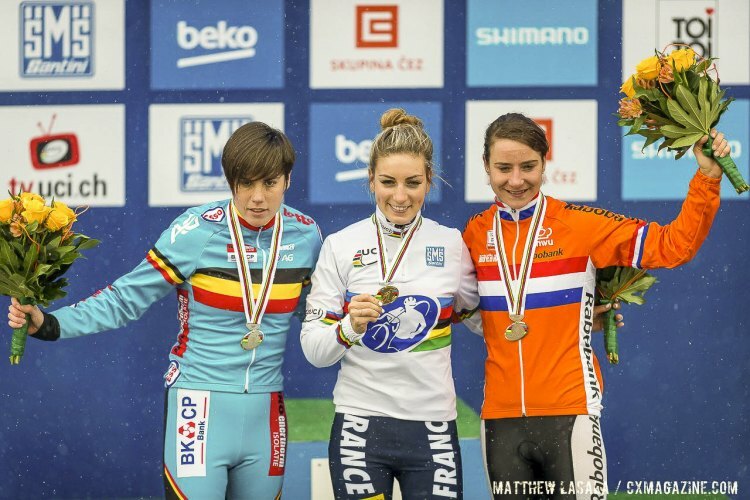 It all came down to the final lap, and Czech Katerina Nash’s two crashes and Ferrand-Prevot’s strong sprint made up a thirty second spread, which dictated the medals. The third table is an attempt to rank a rider’s consistency. There are different ways to view consistency, either from a standard deviation expressed as a percentage, or how much the rider deviated from their average lap time. We chose the former for the ranking, but talk about the latter. We compiled this table differently than the men’s race. We have two consistency rankings, one that excludes the first lap (as we did with the men’s race), and then one that includes it. We also have four more columns that reveal riders who had slower first and last laps (compared to their average lap times), and then racers who had faster first and last laps. Only riders finishing on the lead lap are listed. Sort the table by any field. Thanks for reading this far. You’ve impressed us again. See our analysis of the men’s race here.